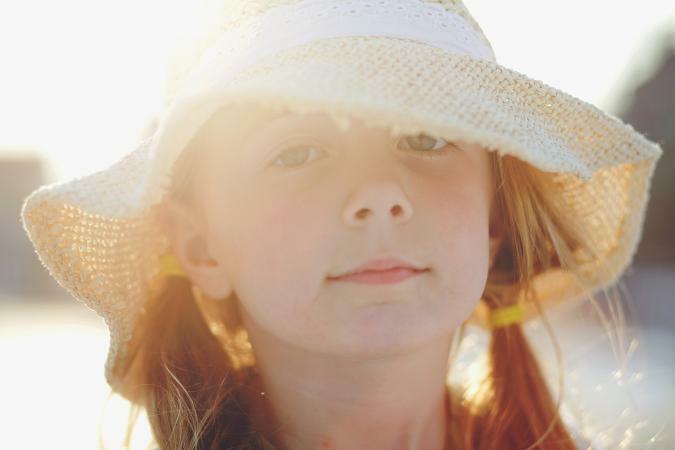 A kid's beach hat is an essential part of sun protection for a youngster during the summer. Just because a beach hat has a duty to perform doesn't mean it can't be fun, however. Parents looking for a beach hat for their children will find a huge selection of colorful designs perfect for all kids' tastes. A kid's beach hat should look summery and suitable for a child. You'll find these summer-ready toppers in solid colors, as well as decorated with plaid, polka dots, stripes, florals and beach-themed items. You may even find a swimsuit for your child with a matching hat. Parents will probably be happiest with easy-care beach hats that can travel directly from outdoors to washing machine. Look for soft materials that make it simple to fold or roll the hat and stuff it in a beach bag or tote. Tightly woven material: Look for hats made of canvas, cotton, terry cloth or straw. Inspect straw hats to make sure they're tightly woven so that they do their job of keeping the sun off your child's face and neck. Wide brim: Leave the baseball caps at home when heading to the beach or a long day outdoors. These popular caps will leave the back of your child's neck exposed, making it the perfect target for sunburn. Great beach hat options should have an all-around brim to provide shade for a little one's face and neck. Chin strap for young ones: Babies and toddlers sometimes pull hats right off their heads, so look for beach hats with a chin strap. Once the strap is secured, you won't have to worry about your baby losing his much-needed hat. An SPF product: A beach hat can't do all the work; you also need a good sunscreen. There are products on the market for children of all ages. Buy the highest SPF you can, and reapply it often, especially if kids are swimming and sweating. Avoid the hours of 10 a.m. to 2 p.m. when possible: These are often the most brutal hours of the day, when it comes to heat. If you can plan your outings outside of those hours, you'll lessen your chance of sunburn. Provide plenty of shade: Very young children shouldn't get a lot of sun, even with a good sunscreen. Take a big beach umbrella or portable shade tent to the beach, park or wherever else you plan to spend a sunny day. Summer is often a child's favorite time of year. She's out of school, she gets to spend more time with her friends and she can take a dip in a pool or in the ocean. Don't let a sunburn ruin the fun! With a selection of beach hats to keep your boy or girl stylish and protected from the harsh rays of the sun, he or she is sure to look good while keeping cool, all season long.